Hola game master. Please be advised, my Faster Combat course is closed for enrollment at this time. + How to Make Your Stories Gut-Wrenchingly Glorious at the Same Time! Combats that take too long kill games. It can’t be said more plainly than that. If an hour goes by and you’re still on round three, you know your players are getting bored. You’re bored. Everybody’s frustrated. Why can’t this thing go faster! 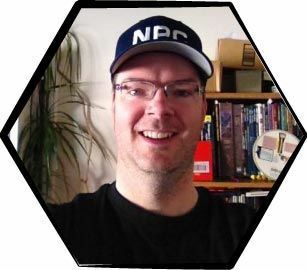 Hi, this is Johnn Four, professional RPG writer and publisher of RoleplayingTips.com. And I’m telling you – nay, beseeching you – if your combats aren’t fast-paced and exciting, your group will lose interest. Players will start fiddling with their cell phones or talk out of character about meaningless stuff or just quietly disengage and think about what they’d rather be doing instead. By not solving this, you’ll game less often or have more missing players each session. That causes you all kinds of problems planning and filling in adventure holes last minute. But if you can chew through combats fast like a monster truck, without sacrificing any of the excitement or drama, instead of reluctant players you’ll have raving players chomping to play more often! You will be the hero GM because fast combat is difficult to pull off if you don’t know the tricks and techniques. This makes you a rare GM and your players will not take you for granted. Why does combat grind down slower than a dwarf in heavy plate? Chances are your players are slow. Each player sloths through their turn, hesitant, undecided or indecisive. That kills any momentum you try to build. It’s like a flu where one slow player makes all the others game in slo-mo too. You need to vaccinate your games against this with a little player education and a lot of simple GM procedural stuff that take only moments to put in place. Another reason combats become endless is bad encounter design. Before combat even starts you’ve been shot in the foot. Why make every combat a fight to the death when much more entertaining – and faster – options are available? Why build up defences that make everybody miss instead of improving offence to make your players thrilled with their attacks but still worried about their foes’? Thrilling combat encounter design is one of those silent GM skills players will not immediately spot during the game. Instead, on their way home, they’ll suddenly realize how awesome the crazy and fast fights were during the game. That’s when they’ll appreciate a GM who’s mastered encounter design. Do not put up with featureless battlefields and boring tactics. This is the sweet spot opportunity for you to match great design with awesome foe GMing to make combats sizzle. For example, I take opportunity attacks on my foes all the time to put them in advantageous positions to stomp on the PCs. Sure my NPCs and monsters take extra damage, but think about the combat as a whole. The players get to make extra attacks – and how excited do you think they are about that? – and my foes get put in better positions to unleash unholy fury with their special attacks and abilities. Plus combat goes faster because damage output goes way up all around. Speed, excitement and carnage from just a few design tweaks and tactical risks. It’s all in your hands. Tony Medeiros (LeonineRoar.com) and Johnn Four (Roleplaying Tips, Campaign Mastery, GM Mastery) have teamed up to create the world’s first online course for game masters. We will show you how to double or even triple your combat speed. 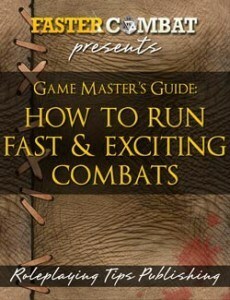 Our 52 week, massive online course show you exactly how to speed up your combats, step by step. Each lesson shows you what to do and exactly how to do it. Plus, Tony and I will be there to coach you – you can ask all the questions you want and we will personally answer them all. We teach you how to read your players’ combat personalities so you can make called shots with your designs. We also show you how to conquer the rules once and for all, and how to help your players do the same. Almost three months of going through step-by-step encounter design, monster tweaking and battlefield design all pointed at making combat lightning fast. This is the most intense part of the course. Roll initiative! Run combat efficiently while adding creativity and excitement at the same time. Yes, it’s possible. You will learn how to do this plus discover how to calculate things faster, make player turns faster, run the grid faster and more. Players remember most how a combat ended. It’s how we all judge encounters – by their end. 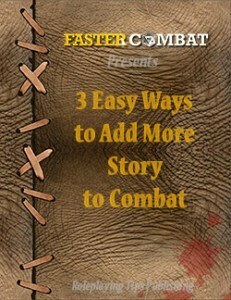 Finish a combat fast and with flare and you build session momentum for more great gameplay. This is the secret to becoming a legend as GM. Because momentum stacks. In the six weeks devoted to this section, we show you how to add roleplaying to combat to generate tactical advantages, alternate outs to end stalled combats early so you can move on, how to make better judgement calls, how to handle problem rules and much more. It’s time to graduate as a master GM who runs amazing, fast and thrilling fights. In these 12 weeks we talk about props, what tasks to delegate and how, shaping rewards to get more out of your players, how to do post-mortems so you can learn how to improve your own combats forever more, style and consistency and how to be a leader at the game table. In addition we have a couple surprises planned for you as well. What is our Critical Miss Guarantee? You could go buy one hard cover or you could get a year’s worth of valuable lessons, and a lifetime of GM learning. 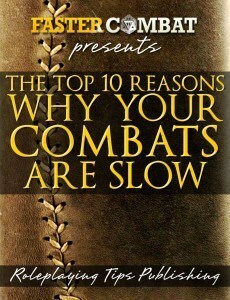 Through 52 lessons packed full of specific techniques and methods, plus secret bonuses, we show you exactly how to plan, design and run the best combats of your life. 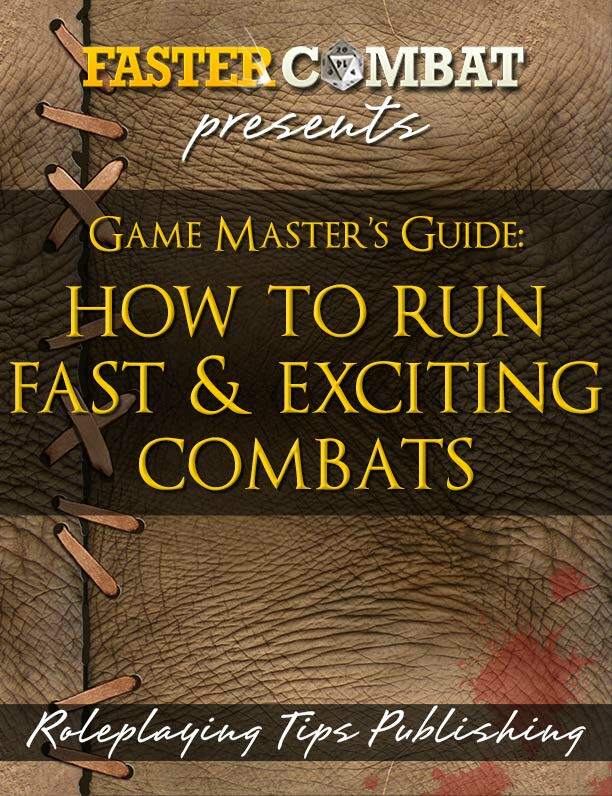 You will learn how to become a combat master. This puts you in the elite amongst GMs. You have a full 60 days to try our online course for GMs. If we roll a 1 for you, just ask for your money back. No hassles, no questions, we will simply give you your money back. If we roll a critical miss, you get your money back. That’s a promise. So there’s no risk to you. Enroll today and become an elite GM. I would really love to see you become a member, double your combat speed, and join the other members in the activities and conversations in each lesson. So I’m including several cool bonuses. Make your Will saving throw or buy! I’ve converted the entire course into a 267 page PDF. This is the portable version of the entire course – take it with you on the bus, to work, or to your games. Read it whenever and wherever you like. It’s a bookmarked PDF with Table of Content and has a print-friendly format. Combats are tricky beasts. In addition to the number crunching, tactics, and rules lore, you’re expected to be entertaining. Well have I got a great tool for you. 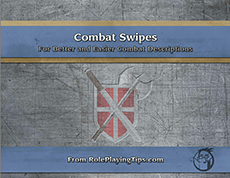 Combat swipes are colourful combat descriptions you can use during combat to create awesome blow-by-blow descriptions. I’ve compiled over 250 read-aloud combat action descriptions for you into one slick PDF you can download immediately as a Faster Combat member. No more boring combat descriptions! Use this checklist to immediately diagnose problem areas in your combats at any time. Use this tool before and after sessions as a guided way to make constant improvement to your GMing. I’ve been kinda hypey and over-the-top in places here on this page. But it’s because I believe so much that we need to GM impeccable, fast, and story-filled combats. Slow combats are an achilles heel to having more fun at every game. As boredom sets in, our players’ interest in the game wanes. A downward spiral ensues. But the way Tony and I have structured this course and all the bonuses, you are guaranteed to become amazing at running combats, and any type of action scene, really. So please buy my course today. You will not be disappointed!